Choose Your Own Sexual Harassment Adventure! 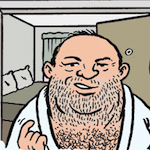 Cartoonist Jen Sorensen explores women’s options when a rich, powerful and lecherous man stands in their career path. Surely we can do better?